ARP has developed an innovative multi-purpose accessory stud that can be used for exhaust systems, intake manifold and exhaust manifolds. The studs are manufactured from a proprietary alloy developed by ARP (Stainless 300) and are impervious to the rust and corrosion that plagues ordinary fasteners. This stainless steel alloy is nominally rated at 170,000 psi tensile strength, which is substantially stronger than Grade 8 hardware. 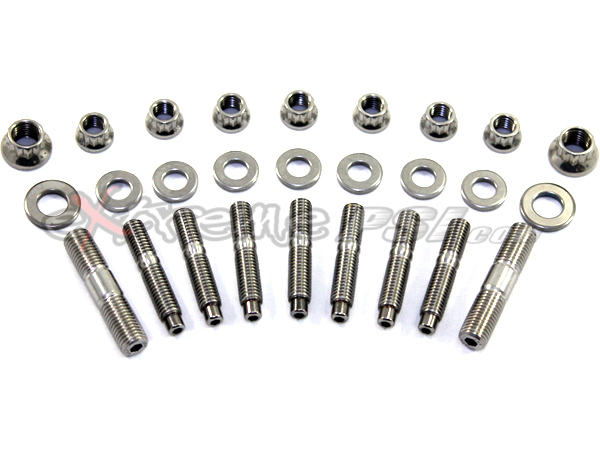 Ideally suited for installing exhaust headers, the 8mm studs have a unique "nut starter" nose and a hex-broached tip - which allos the studs to easily be installed using an Allen wrench. The studs come with "easy wrenching" 12-point nuts, which work great in the tighest of quarters. Includes: 9 stainless steel studs, 9 stainless steel 12-point nuts, and 9 stainless steel flat washers. Fitment: Mitsubishi Lancer EVO VIII/IX. Exhaust manifold to head torque specs: 18-22 ft. lbs. Want this item shipped out today, April 24? Order within the next 37 minute(s).